Rumors of the Blackberry Torch 9860 arriving on T-Mobile have been going on behind the scenes for some time. The passing of the Blackberry Torch 9860 with AWS bands through the FCC at the end of July pushed the rumor mill even further into the camp that this could very well arrive on T-Mobile. 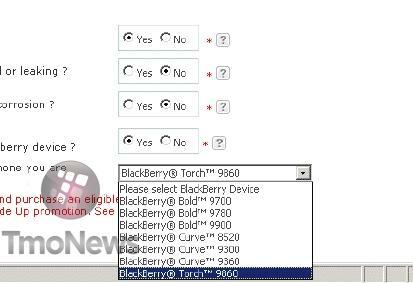 Now some internal screenshots offering up trade-in information regarding Blackberry devices T-Mobile carries currently or will carry now have hit our inbox showing the Blackberry Torch 9860 as appearing in the system. Also noticeable is the appearance of the Blackberry Curve 9360, another Blackberry we know is T-Mobile bound later this month indicating that future Blackberry devices could very much make an appearance on this trade-in document. While this information isn’t concrete, our ninjas are telling us that Blackberry reps have indicated T-Mobile would carry the Torch 9860 once AT&T’s one year exclusive was up and that time has passed. So we’ve got our ninjas working to uncover more information but anyone looking to score a Blackberry Torch 9860 on T-Mobile has good reason to start saving those bucks as we don’t expect it to be too long before it hits store shelves. ← (Updated With Deutsche Telekom Statement) AT&T Might Not Be Required To Pay T-Mobile Break-Up Fee After All? Tmobile has been on a roll lately on releasing great devices. I have bad new. I have blackberry 9860 on t-movile and the bb browser don’t work, and does not work any application, Faccebok off, twiter off, messenger yahoo, gmail and windows live off too. Those applications only work when you have wi-fi available. For the internet I had to install the Opera browser. And the T-Mobile technician says that the browser does not support this model blackberry on T-mobile system. This model only has Bell Canada and Orange, T-Mobile will never sell this model. I had this phone on att. It’s ok I Guess ..it’s actually not that bad. But I still prefer android. YOU NEED TO KEEP UP WITH PHONES HONEY THE BLACKBERRY TORCH IS AN OLD PHONE ITS BEEN OUT FOR 1-2 YEARS AND T-MOBILE IS JUST GETTING IT. :/ I HOPE THEY ADDED SOME STUFF TO IT.. ANYWAYS I LIKED IT SO IM A GET IT JUST TO HAVE IT..
Diamond Prince, Honey. The Torch 9860 which is what this article is reffering too hasn’t even been released. The Torch that has been out for a while is the 9800/9810. You’re both a couple of honeys hahhaa. I don’t think it will happen. 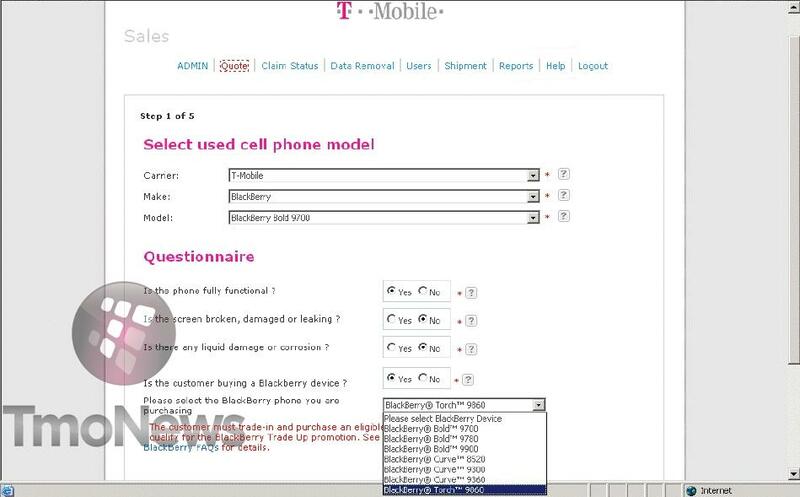 This screen shot is from tmobiles trade in program and is all jacked up. One time I saw the iPhone and the thunderbolt on there as well but since has been taken off.. I agree, this is from the trade in program and phones from other carriers are accepted. If that’s the case, why are only T-Mobile’s Blackberry’s in this list (besides the 9860)? Multiple blackberries have graced my account but it’s hard to care about this with the iPhone possibly on the horizon. This is actually one blackberry device that I think is pretty decent from what I’ve seen on YouTube. If the price is right I might be tempted to pick it up as a backup phone. The 9860 is really nice though…for real. I may be getting this one. 3.7 inch screen to read my email attachements. I can dig that. Plus, when I open a link on twitter, no more tiny 2.4 inch screen and 600 mhz processor. What the hell that blogger talking about ninjas. As a african american i know what the hell ninjas mean there need s to be some corrections on that.